I've been working and playing with art since grade school, some times more seriously than others. But throughout my 25 years as an HR consultant, I always planned to give more time and energy to art when I retired. That time finally came nine years ago, and I finally got up the nerve and commitment to do what I had said I would do. My finished work, some of which is available, some already sold and some in private collections, is posted here on this site. For information, prices, framing and anything you would like to discuss, please email me anytime, at susanbonnell@olympus.net or call 206-367-1418. My earlier work and art progress is posted on my blog at susanbonnell.blogspot.com but I no longer take the time to update the blog. I need to spend my time painting! 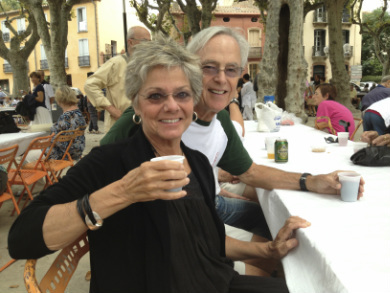 The photo above is my husband Bill and I in Collioure, France at the annual Sardine Festival. Matisse, Monet and other impressionists painted in the beautiful and magical light of Collioure, on the Mediterranean in Catalon territory, in the early 1900s. The photo is from our last stay there in September 2013.